The first meeting of spring drew a lovely crowd, excited to learn about the Silhouette from Abigail. 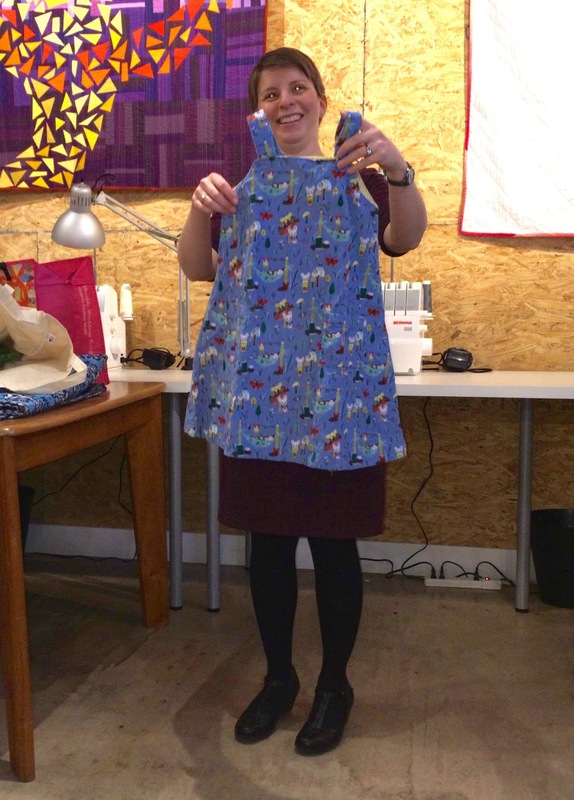 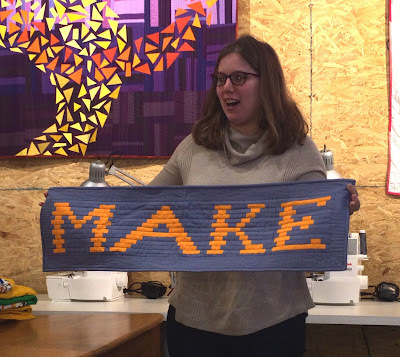 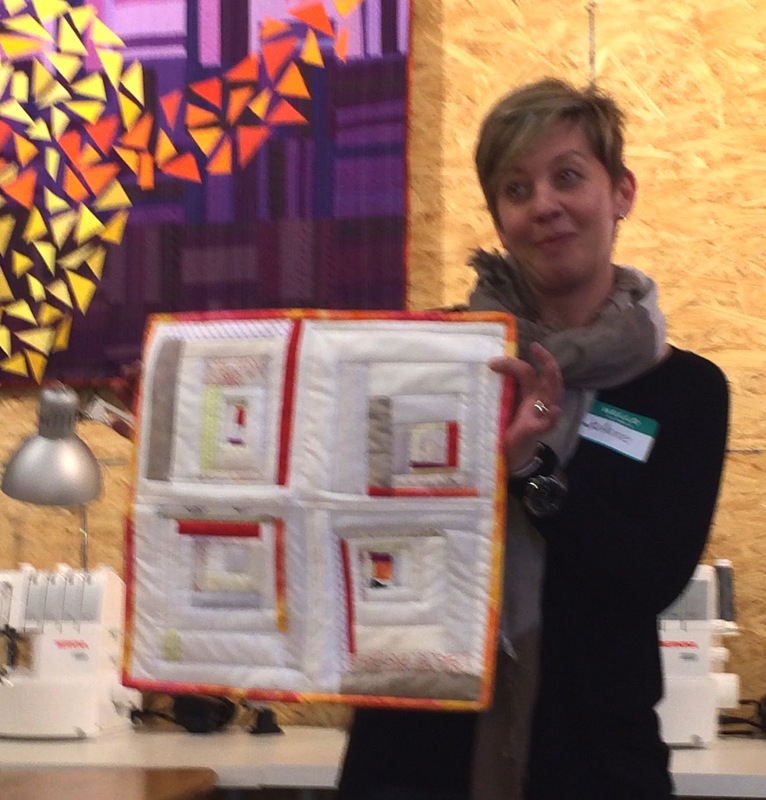 We got to see all that she does and even try it out on some of our own fabrics. 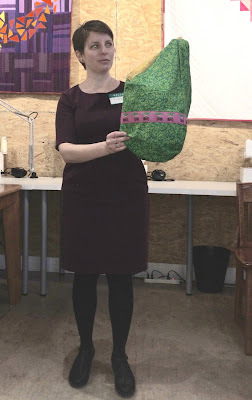 Our show and tell at the March meeting was the largest we've ever had - and without our professional photographer on hand (we SO missed you Taz! 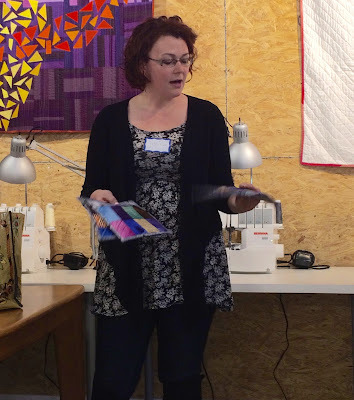 ), the need for photo editing was a bit intense. 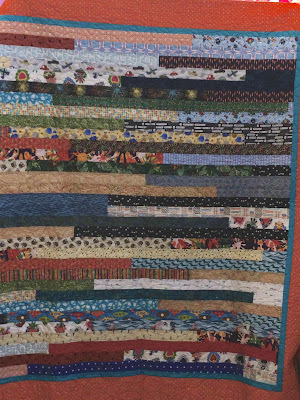 Sorry if the colors of your quilt did not come out accurately, I'm working with an iPhone 5 here! Kaesmene's cool (get it?) 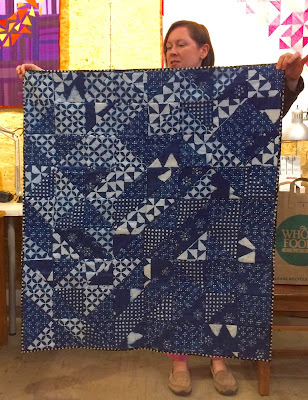 quilt for her son, Indigo. Kaesmene's paper pieced bee quilt has us ready for summer already! Kaesmene's quilt for her daughter, who chose the fabrics. used it to practice Sashiko. How sweet is Regina's camping jumper? 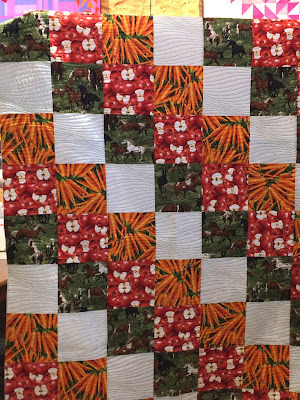 and little produce tote with beet ribbon trim? 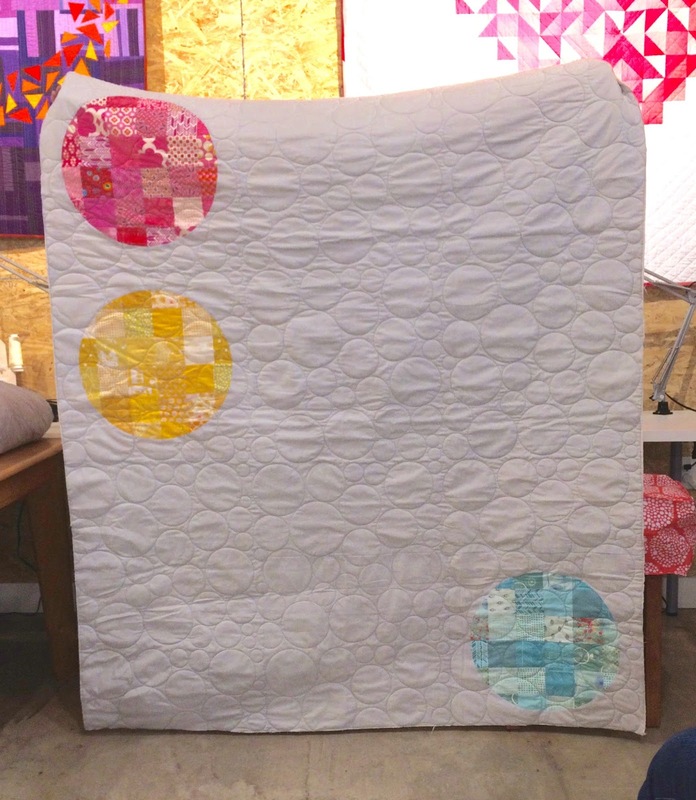 Heather s soothing round robin quilt. 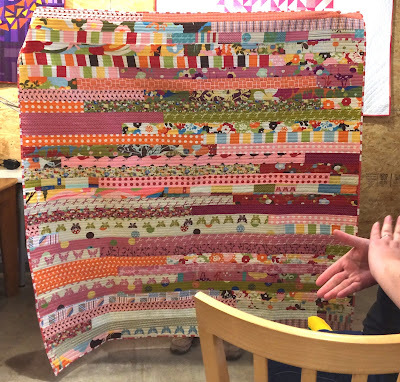 Rebecca managed to finish this amazing baby blanket just in time. And another one Gretchen whipped together for her boss's baby. 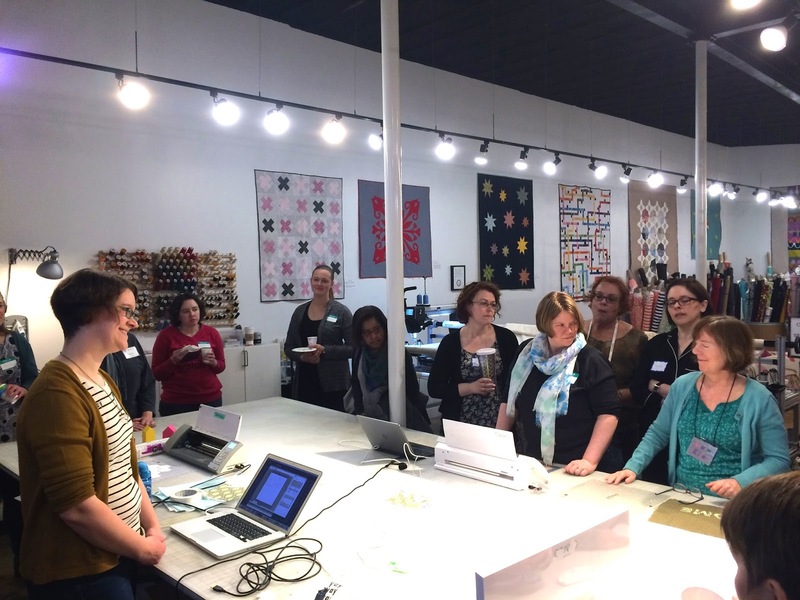 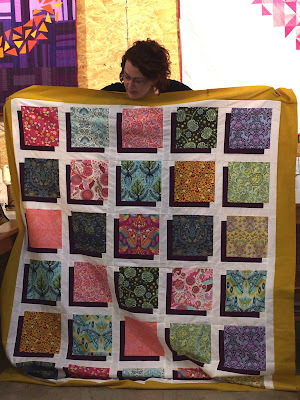 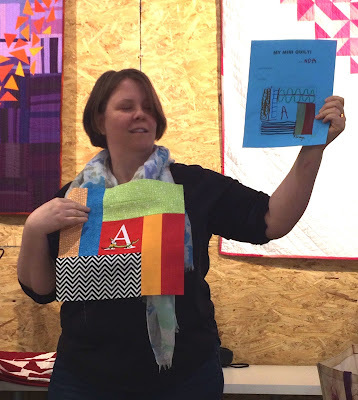 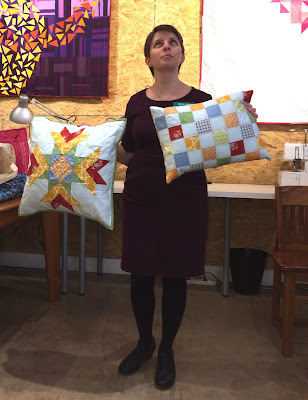 Wondering about that screen printing class at QuiltCon with Karen Lewis? 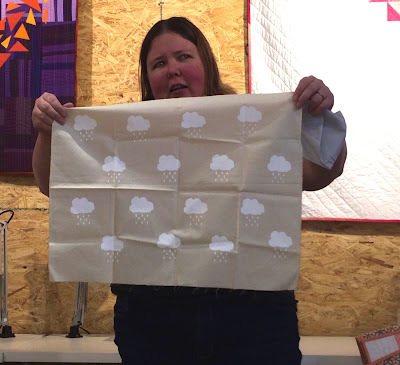 Gretchen went, and look at her little rainclouds! 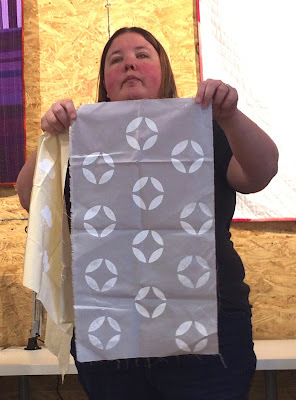 Can't wait to see how she uses these! 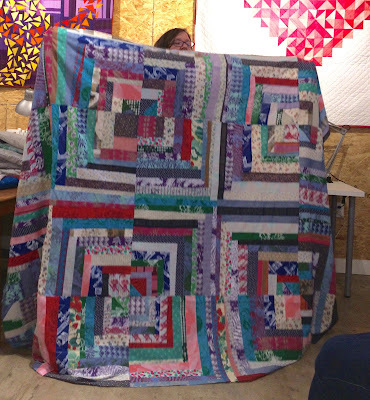 Joanne has already finished her quilt for our Open Studios/Quilt Show challenge. 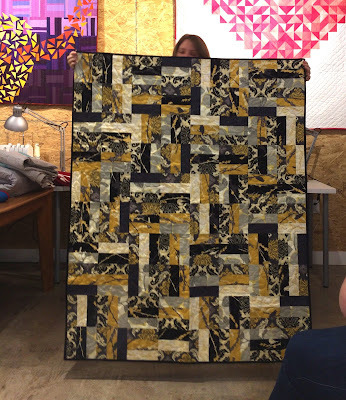 That bright border beautifully frames her modern take on the log cabin block. 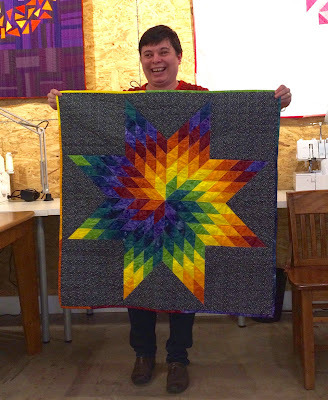 We are in LOVE with Jeanne's rainbow sewing machine from a pattern by Amy Friend. 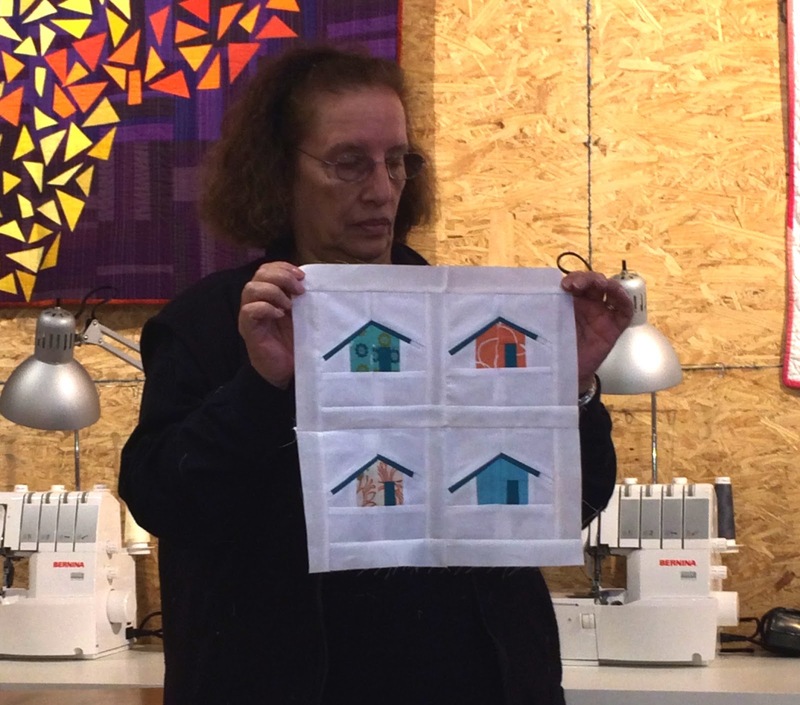 And these sweet houses she made for a friend. Yoli pieced this lovely quilt. and she rounded it out with another sporty one! 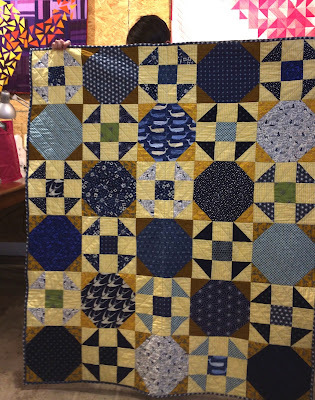 on the traditional disappearing nine patch. 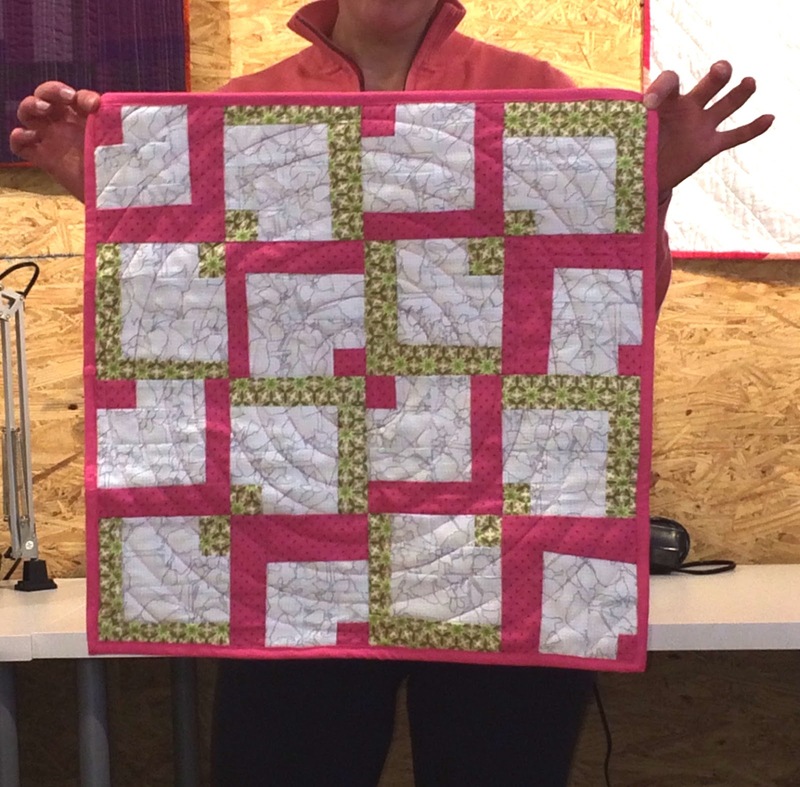 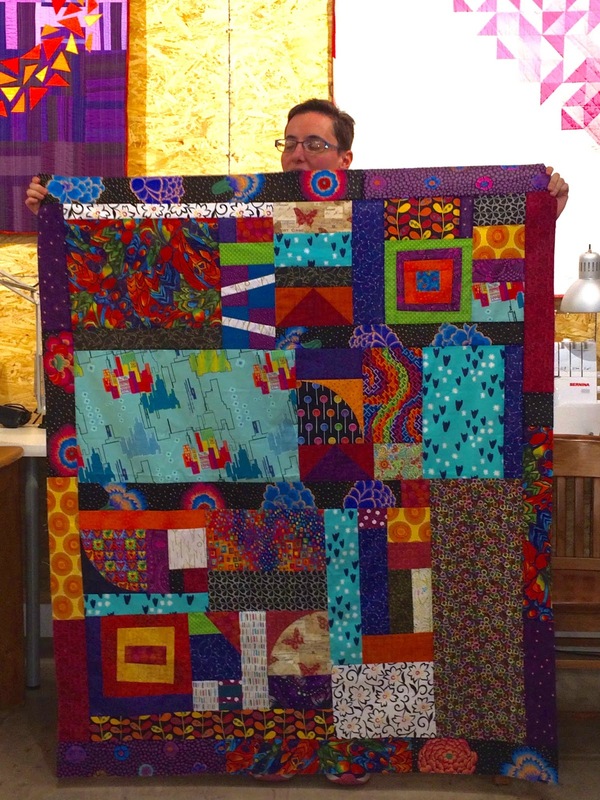 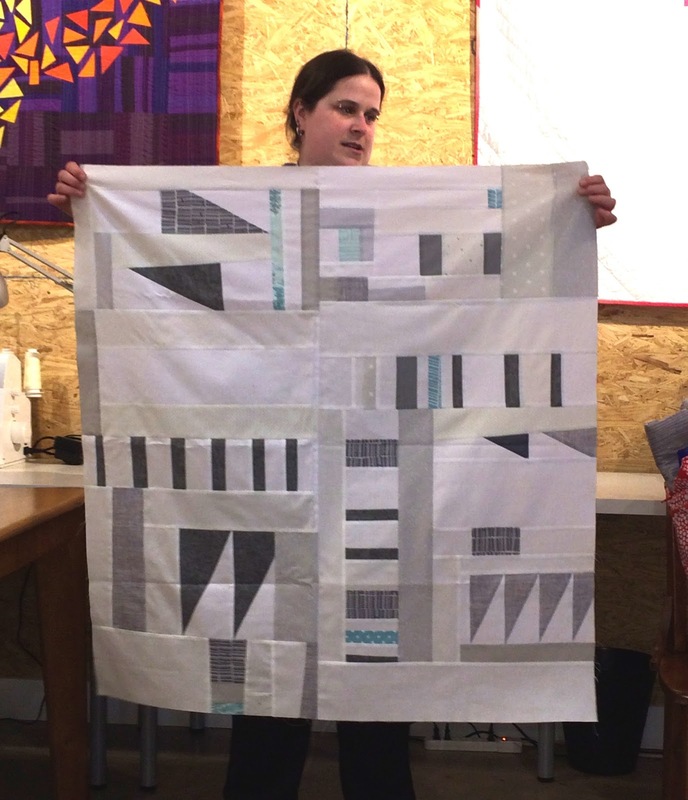 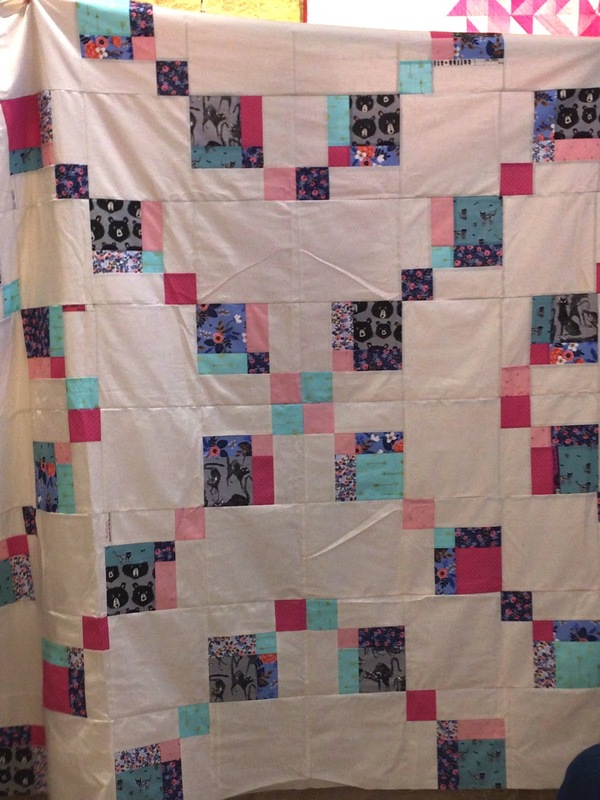 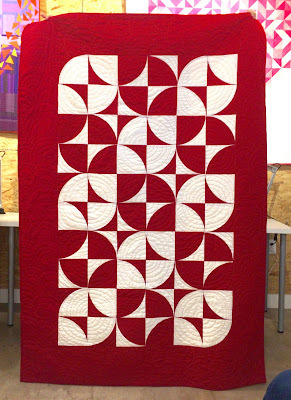 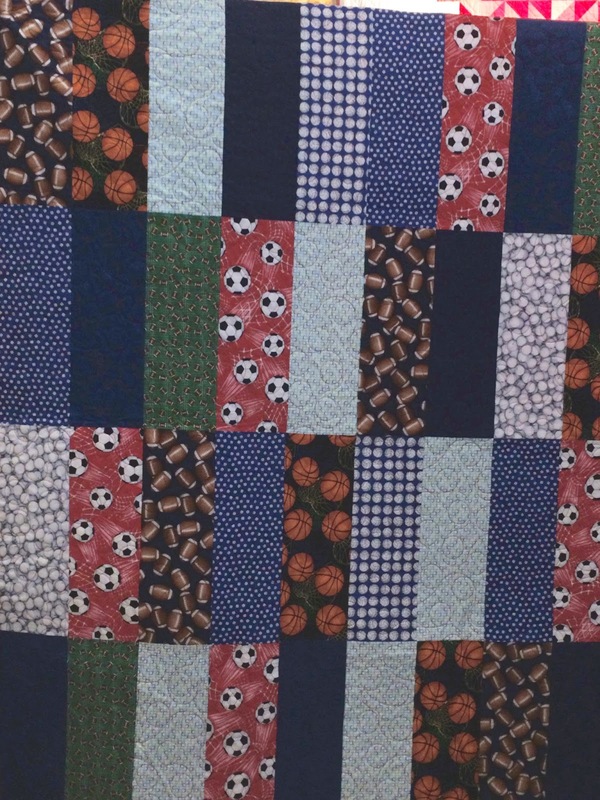 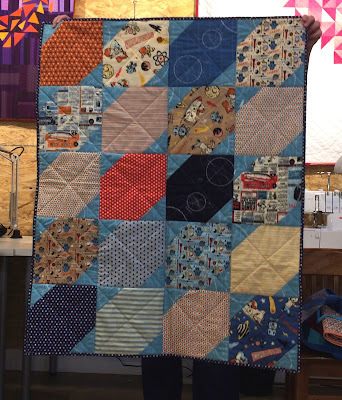 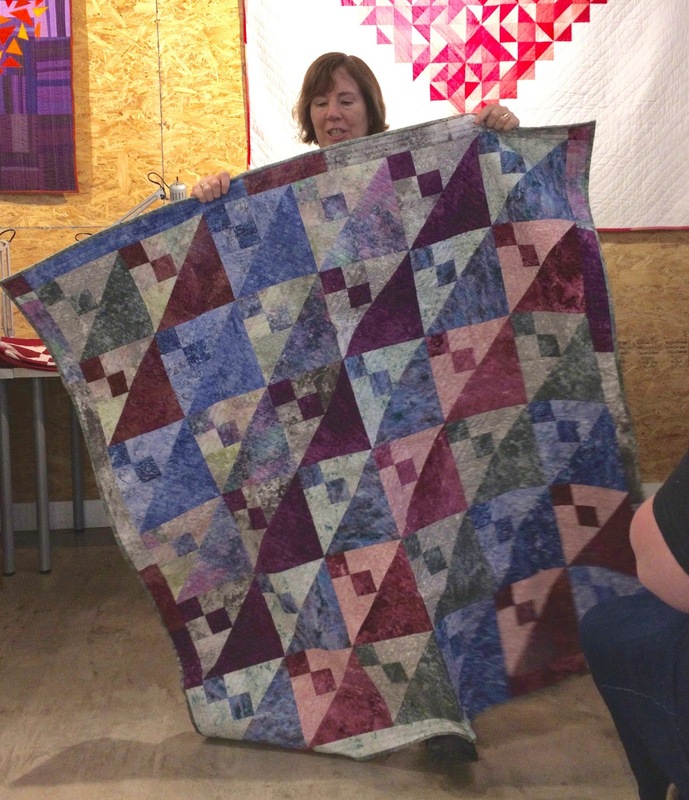 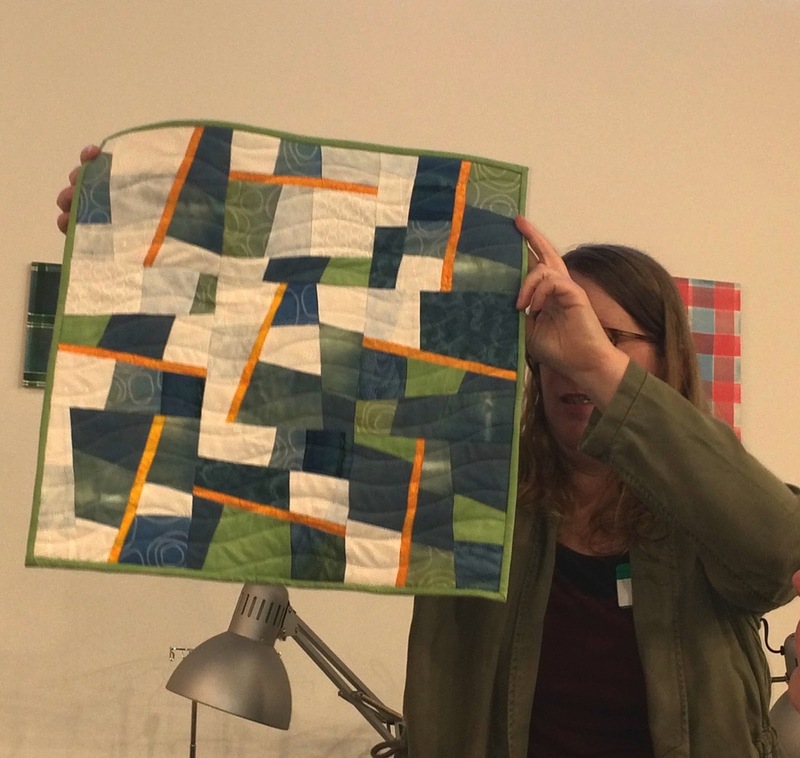 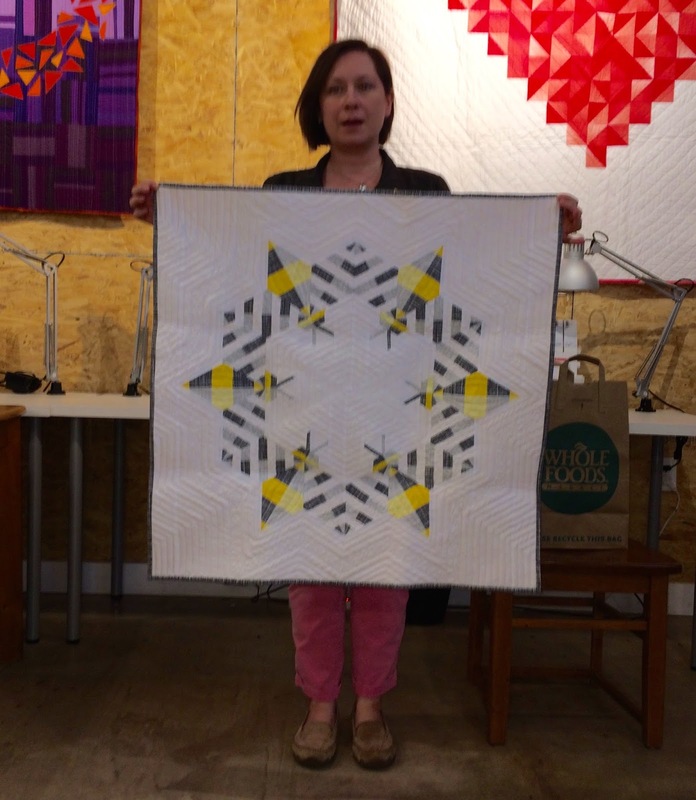 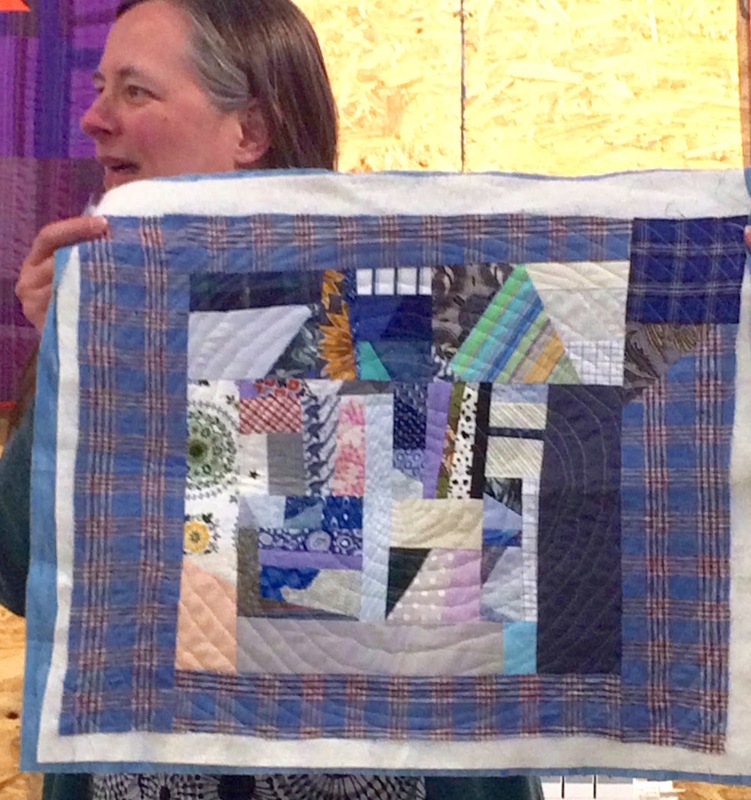 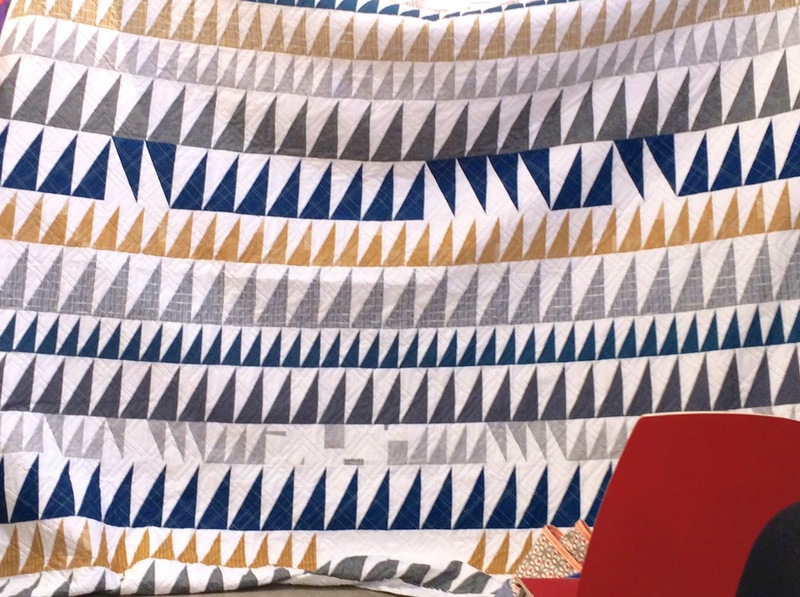 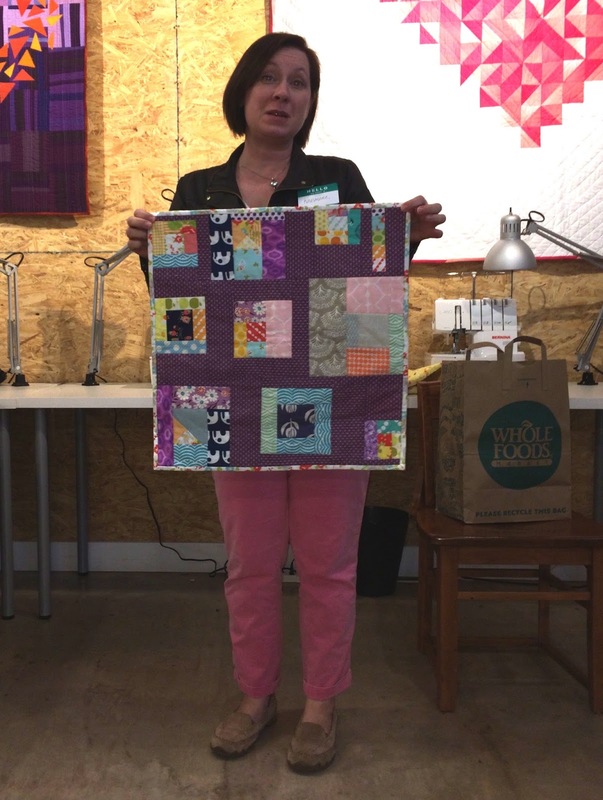 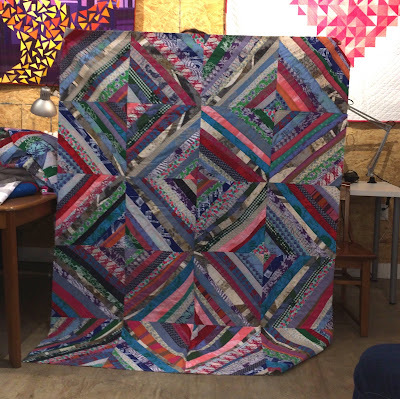 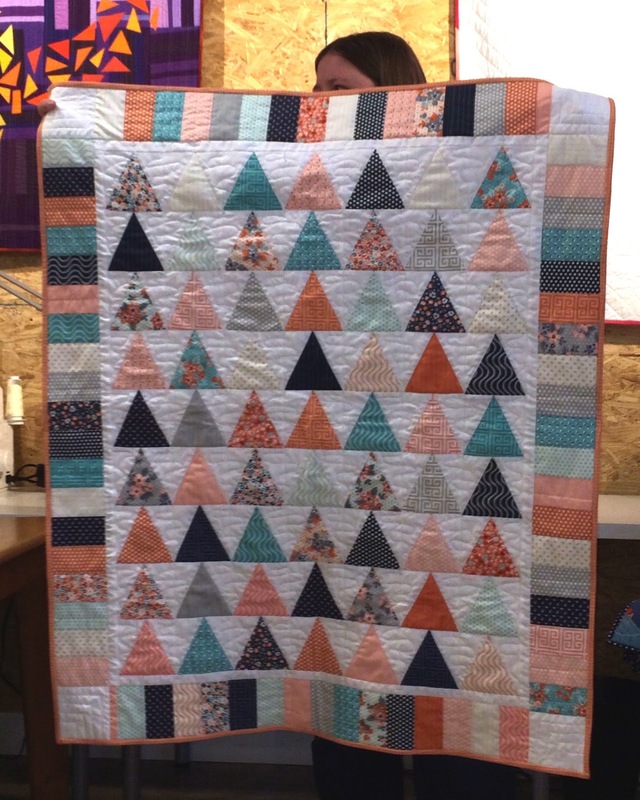 We love this Make quilt that Rebecca started at Sew Boston and finished at Quilt Camp! Jessica made some awesome pot holders with quilty leftovers. 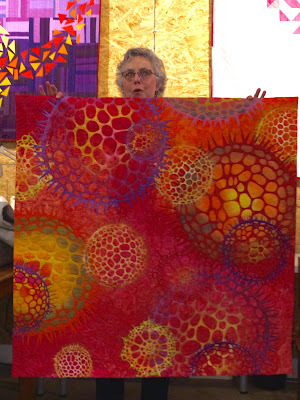 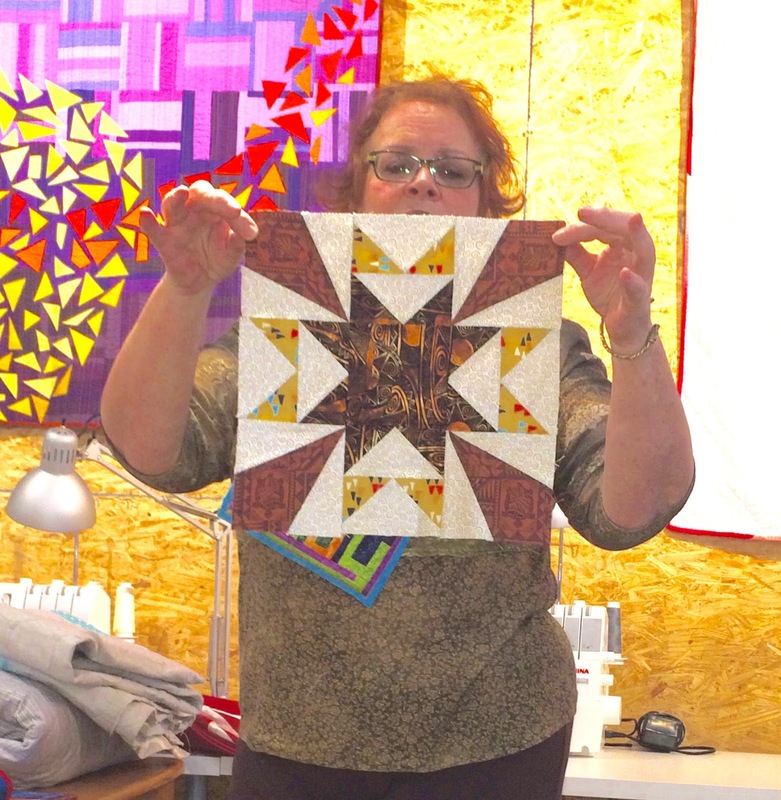 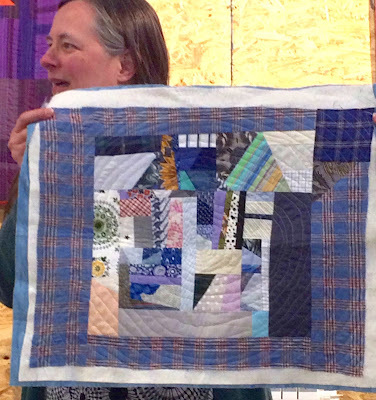 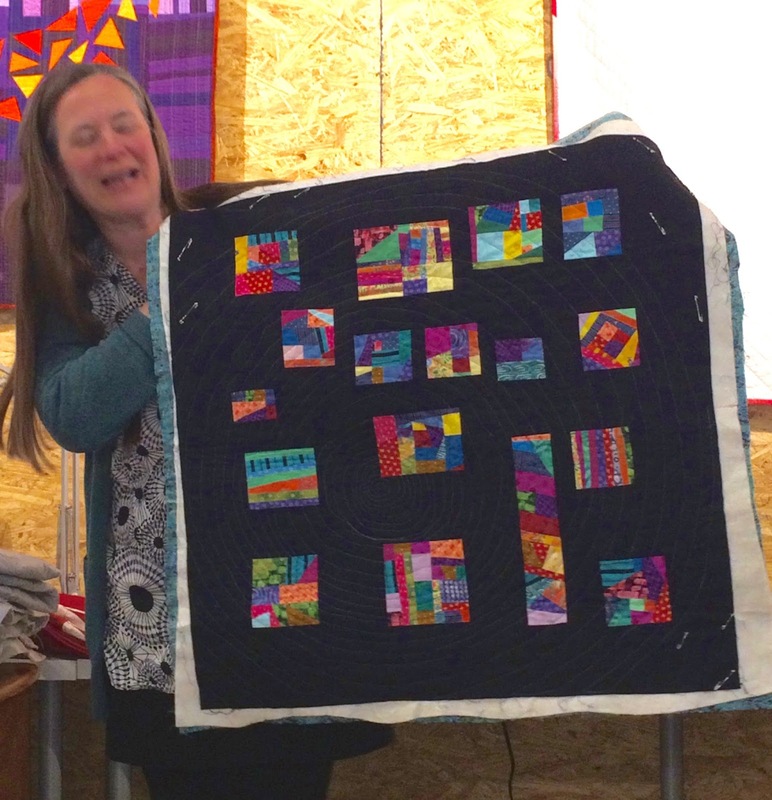 Jessica's vibrant 3D quilt shows off some beautiful fabrics. and this happy one as well. 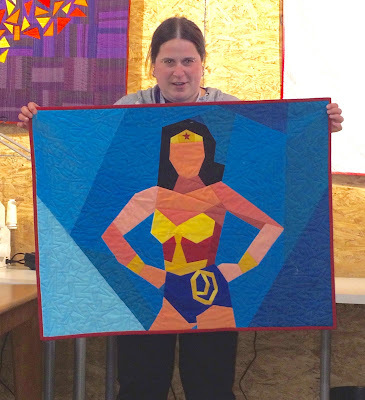 Allison shared her Wonder Woman quilt, a gift from our guild on the occasion of our first anniversary. 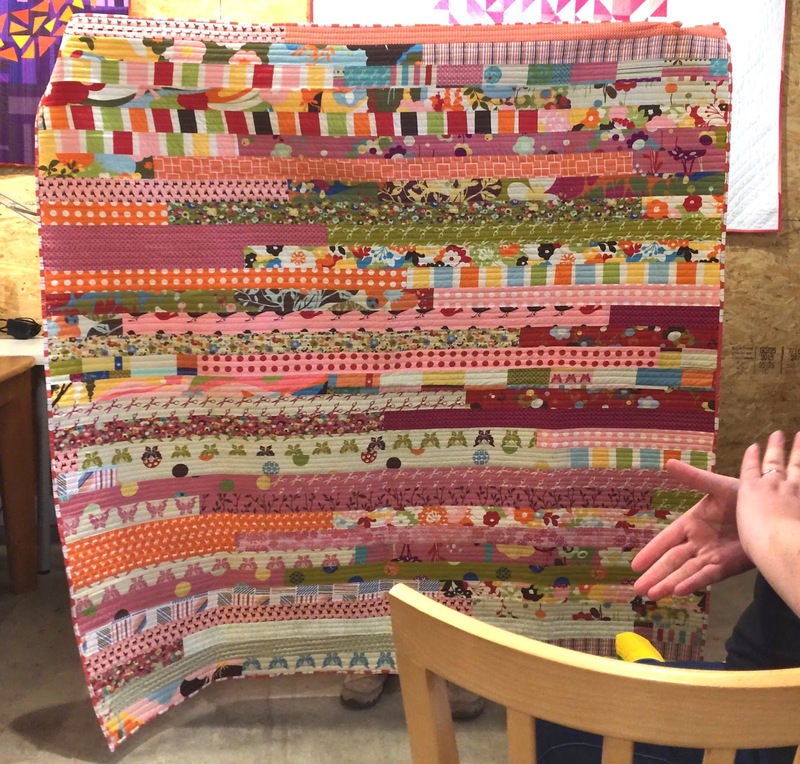 If you didn't hear about it, it was because we were trying to keep it secret, but it's from you too! 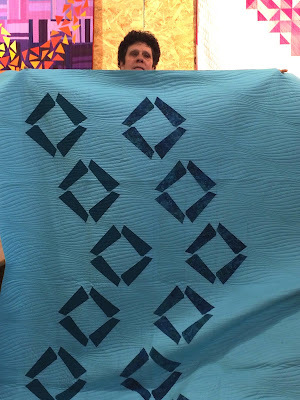 can ever accuse their bedmate of having stolen the covers. 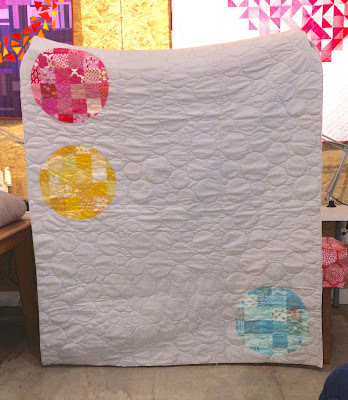 Allison's bubble quilt is pieced and also quilted in bubbles. 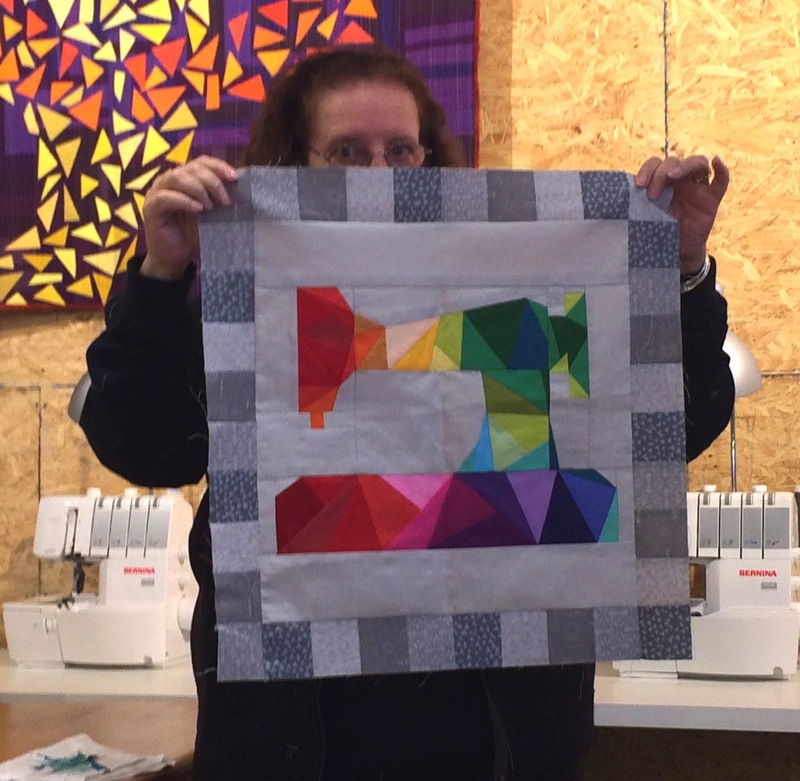 And this amazing number that she made with the help of a Silhouette! 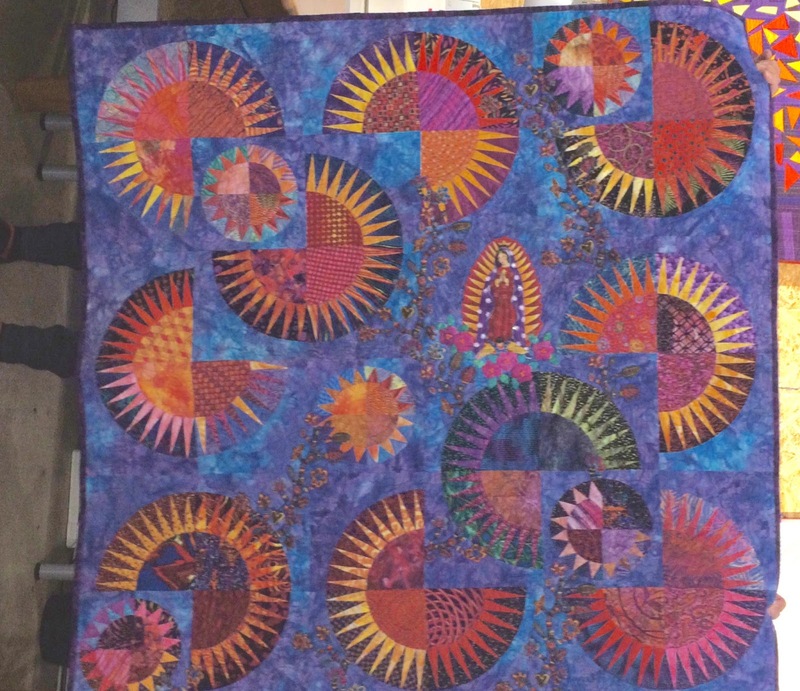 Felicity was practicing spirals on this cool number. The dark background on this one really made the colors pop. 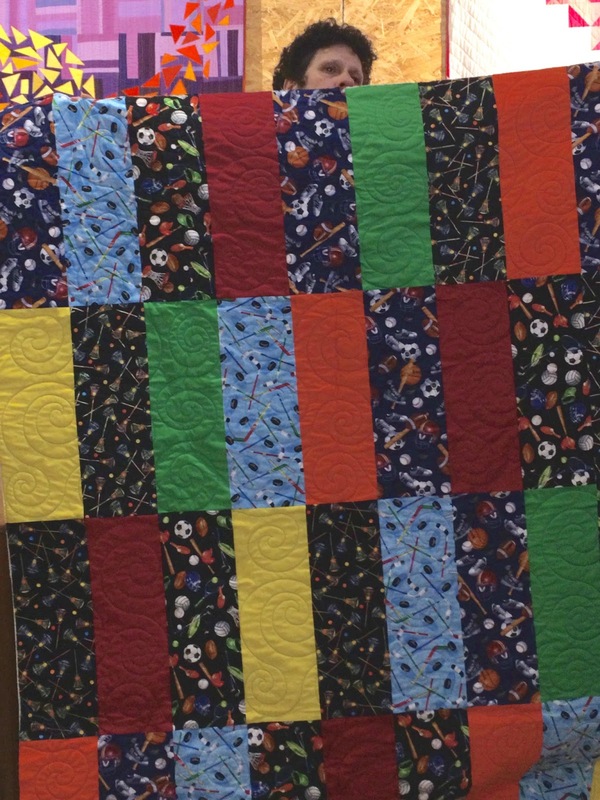 Heather's aunt requested quilts for all the cousins made out of her old dresses. 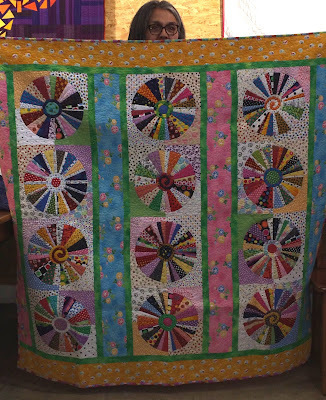 Good thing she has such good and colorful taste! Another cousin quilt from Heather and her aunt. 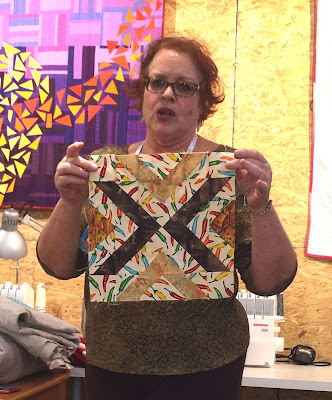 Hildy's working her way through the quilter's cookbook. 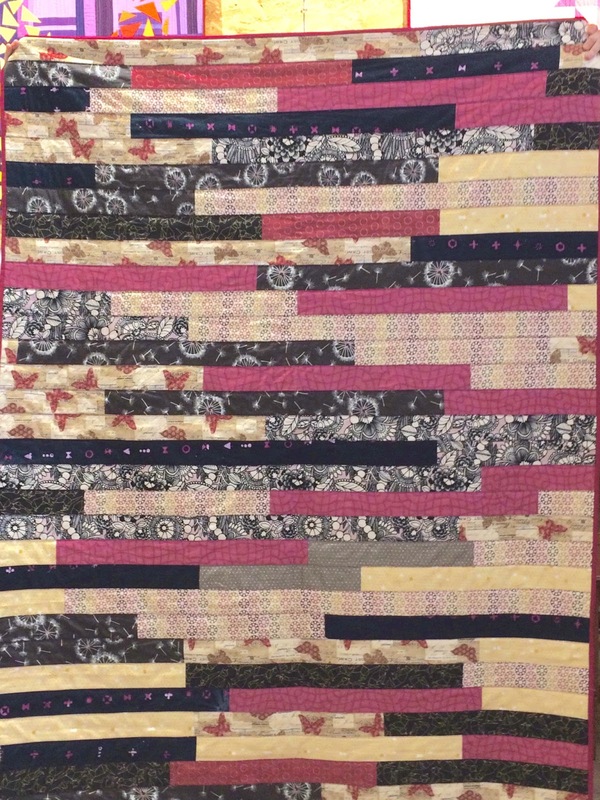 One of the things I love about a guild is how you start to recognize people's color choices. 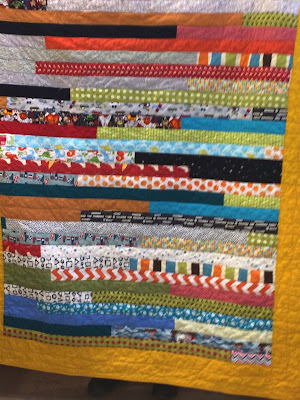 This is a Hildy block if ever I've seen one! Sarah finished this sophisticated quilt just in time for Mother's Day. 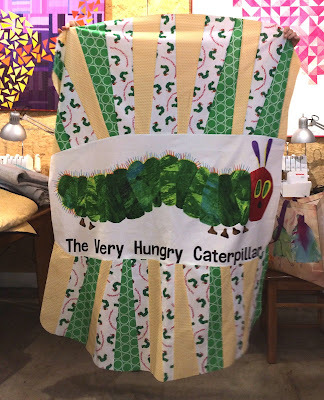 Sarah also did this caterpillar quilt, cleverly shaped like a butterfly. 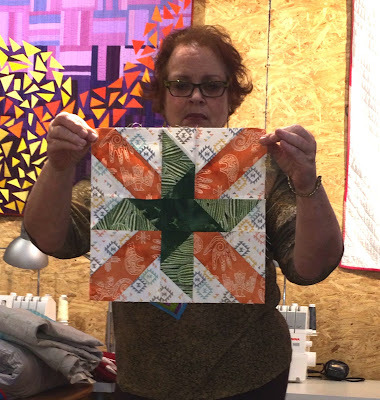 blocks on paper that she then sews up with fabric. Kim had this old top lying around and found new ways to quilt it. a modern take on the traditional log cabin. 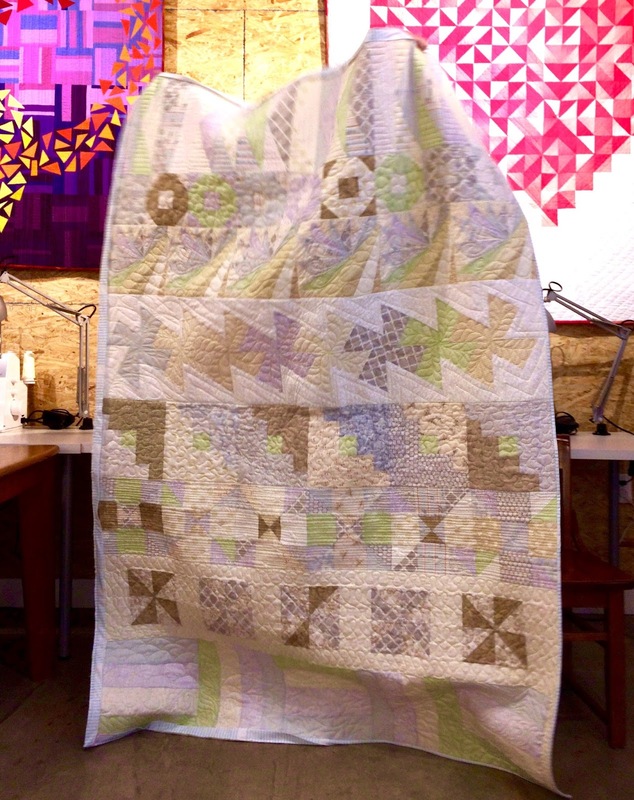 That's it for your March wrap-up! 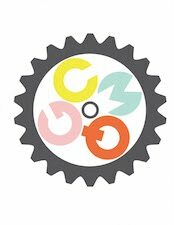 There are only two weeks until our next meeting - so get cracking on your minis, which are due then. 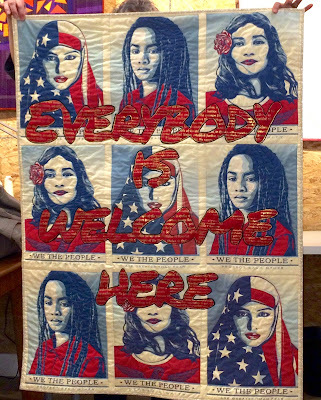 Meeting location TBA. 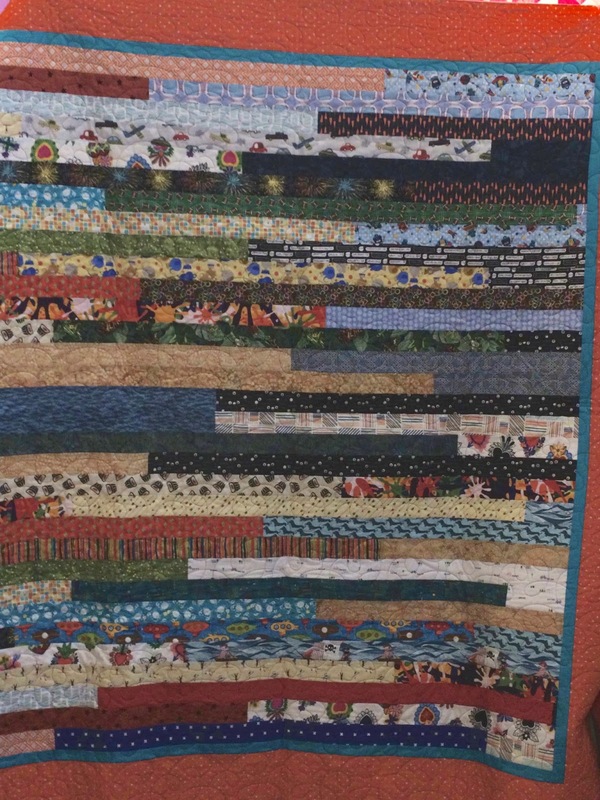 Also, if you're hungry for a quilt show before then, stop by the Newton Library where Sandy has an exhibit up through the end of April! Enjoy this warmish weather and keep sewing.